Would the AI rules be able to handle making your own faction to be the enemy? Could one, say, use this game to play a solo campaign using a big box of Star Saga wave two minis he's not sure what to do with at the moment? Could I design lists to be the bad guys based on the models available as opposed to using the two example AI forces I saw in one of your game blogs? I've been looking for a good solo/co-op/vs sci-fi skirmish ruleset for a while now. I'm starting to get my hopes up. RN Estudio has been sold out of those models for a bit it seems. I did come across some ladies wearing Saint Seiya inspired armor on their website and am now curious how melee is going to work in this. The (main) rulebook has a few scenarios but has set up the main enemy for them. Normal versus games can potentially have 3rd party NPCs as well, but they're currently a non-playable faction. In the early planning is however, a much more in-depth campaign book which would expand into those options. Depends on how things go with the Kickstarter, and where interest lies. So having enemy Player Faction AIs isn't in the rules just yet--- but could be without much effort. That said, the bad guys in the existing scenarios fit quite well with 'space soldiers' or 'scifi raiders' as well as bio or mechanical monsters such as what comes in Star Saga as an example. If I could play co-OP with friends against "customizable" or open faction AI enemies, that would put this ahead of the competition in my book. That's where I was headed with my questions, but I'm also interested in said functionality for solo play. Oh! I don't think I've seen it mentioned yet, or I mixed it up with other news if I did - what is the standard table size? Would 3' x 3' work? Oh man. 48 hours until we go live. In the meanwhile, got a demo table set up for LVO with some added freebies for visitors and demo'ers. Solo play works just fine with the co-op rules without any modifications. Standard tablesize is 4x4, though you likely could make some small rule modifications for 3x3. Namely, changing the size of deployment zones if your mission doesn't allow insertion deployment. Those standees are actually sort of cool. Do you have plans to try and eventually get some figures of your own made for the game? Random thought, but what a D20 game really needs is a 'heat map' D20. So you can seen instantly which are dark red (1-5), red/orange (6-10), yellow/green (11-15) and bright green (16-20). At least 75% of the time you'd know you don't even need to bother to look at the number, and could roll multiple dice pretty quickly. Almost real experience with D20 combat is D&D, but really can't imagine playing a skirmish game at the same speed as a D&D encounter. That's actually quite a good idea. I suspect we don't have those due to how difficult it'd be to manufacture them given how the numbers on a balanced D20 are all over the place. Perhaps at some later date! The idea to begin with is to remain 'bring whatever you like' and not do some designed-for line, as Miniatures add a lot of risk and delay potential. We want to get this delivered very shortly and on time to folks. But it doesn't mean I've ruled out some future work on that. I see most of the minis in the photos on standard 25mm round bases... is that a designated size in the game, or does basing not matter? I'm curious if models on standard lipped 30mm (warmachine/malifaux) bases could be played against models on standard 25mm rounds (40k/infinity) or even odd shapes. Alright folks! We're now LIVE at https://kck.st/2Db9Oki! Exciting times! Heya! The game pieces have a certain presence for legal purposes, but you can use 30mm based models. It's called out specifically how to ensure they're in a playable position. How many missions are there to play vs another player? 6? More? Also rules for 3 players 4? etc? There's 12 missions, most of which can be mixed: One player goes for mission A, the second goes for B which creates asymmetrical play. Whoever can accomplish more VP faster and extract is the winner. Even more players can be potentially supported since it's an alternating activation system, though we left that to your group's discretion to rule for now. 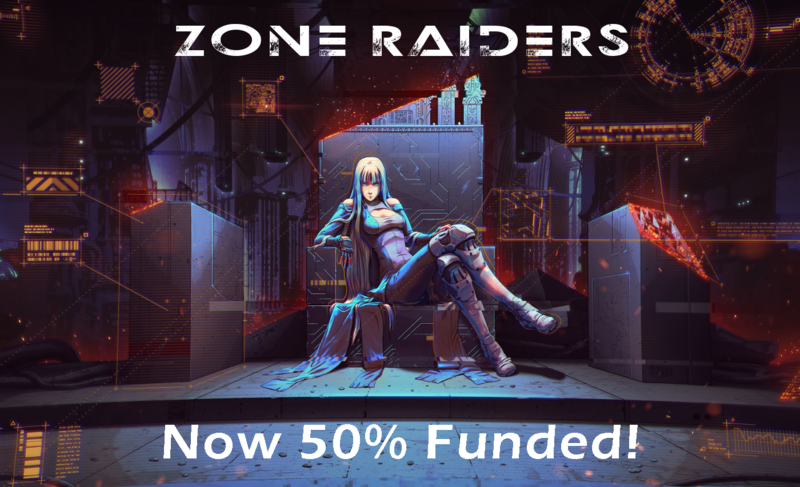 As an aside... we're now 50% funded! Thanks community for pushing things forward! How many co-op missions are there? I'll be honest, I balked a bit at the price, and I'm still on the edge. You can get physical copies of other well put together fully illustrated rulebooks for much less than $60 usd. I understand you are a small shop and good art and layout is expensive, you aren't using this as a loss leader for mini sales, etc. At the least, I would need to see a well done video playthrough before committing that much cash to a ruleset. The game might very well be worth that amount, but it is expensive enough that I'll need some confirmation the actual gameplay is refined and elegant. I was expecting something more like $30, at most $40 for the physical book. Is there any plan for a softcover version? Hey folks! The hardcover prices for 50USD, and can't quite go lower for the number of pages and quality of print. We're a small shop, so these sorts of print costs don't get the benefit of huge bulk. Likewise, a softcover isn't in the plans for now. Well, I do want you to fund, so I'll be throwing something in for the updates, and more for a PDF if it looks too close. On one hand I'm very interested in having just one ruleset to learn for all my miniatures, and the co-op option fits my desired play style perfectly. On the other hand, $50 is more than I can recall spending on a rulebook, and I just got the Gangland ruleset to fill the same role, although I don't believe that set has a co-op option. On the gripping hand, you seem like the kind of guy who would get that reference, and how can I not support such dedication to sci fi obscurities? That really is a pricy book and honestly, more than I'm willing to pay for it. Not sure what numbers you calculated with, but this pricepoint seems only fair if you're not planning to sell more than 250 copies. Otherwise, it's sounding like you're using a POD service that has no reasonable pricing beyond a few copies. I have to admit, I buy a lot of pdf books (mainly RPGs), and $30 for a book is... on the high side. I do not know how much artwork it has inside, but assuming a fair level then the prise seems about right from a small creator with an unknown number of purchasers who wants to hopefully break even or not lose much. FFG has a huge consumer base and can easily absorb artwork and graphic costs with volume of sales. Is it competitively priced? no, does every KS project need to be competitively priced? no. The main question to be answered is what happens after KS once it has payed itself it needs to be competitively priced and original backers will have payed more for it. This looks great but the price does seem high for the book .. Might have missed it, but how many pages is it? Where are you having it printed? The prices look right if you are using a print on demand service for them and are printing a few hundred copies, but a regular printer will give you a much better price, the only thing is you will need to print at least 500 copies, and printing 1000 will probably cut the price per book almost in half. I have a really great printer located in texas, they can do really nice hardcover books for a good price.. send me a PM and I can put you in touch with them. But like I said you will want to print 1000 copies to get the best price, and from there the more you print the cheaper it gets. As a similar product from a company owned/maintained by a single person, with a hardcover book being produced through a Kickstarter, This Is Not A Test! 's hardcover rulebook is $50.00. Armies & Legions & Hordes by Dave Taylor, while not a gameplay book, is a similarly sized hardcover full of pictures of miniatures, that was done through Kickstarter, and is $45.00. Hell, for that matter, rulebooks published by Warlord Games themselves for both Beyond the Gates of Antares and the brand new Warlords of Erehwon are $48.00 and $45.00, respectively. The bigger companies aren't necessarily cheaper because of quantity, either. Both Privateer Press ($50-60) and Games Workshop (it varies a lot, but typically never falls under $40 for an actual rulebook) have always created rulebooks in this price range, and often they aren't hardcover (looking at you, Kill Team, $40.00). And probably most comparable in style, the rulebooks for Infinity are ALL similarly priced at $45+. It's not fair to complain that this price is too high without comparing it to similar products in the industry. Apples to apples. The biggest difference here is that you aren't going to find this product marked down through some 3rd-party online retailer. Add a few of the softcover expansions and we have similiar content. While 50 USD might not be outside of the usual wargaming range price point, it is at the top of it. But I didn't buy any of those, either. Otherworld is similar, it's full color, but it's also a $32.50 softcover. Frostgrave, with a few of the softcover expansions for content, is easily costing more than $50. At least I spent more than $50 when I bought them, even cheaply through online stores. Relicblade would probably be the most similar, containing awesome content and original artwork, but it is still a 6"x9" softcover. And it's priced very competitively to help sell the miniatures for the game. I mean I'm genuinely not trying to argue about it, and my implied tone is anything but confrontational, I promise you. All I'm trying to do is point out that a $50 hardcover rulebook, while expensive, is absolutely not unreasonable when weighed against the field of comparable products. Have I paid $50 for a rulebook that I didn't feel was worth it before? Absolutely, without a doubt. But I've also paid $50 for rulebooks that will sit coveted on my bookshelf for years to come, exceeding that purchase price in value many times over. Ok, how about any RPG by Kevin Crawford, like Stars Without Number, for example? Those are ginormous (and immensely great) books, with great artwork (that afterwards it gets releases as CC), made by a single guy. You can get his games in pdf for free as a basic edition, or for about $20 for a deluxe version with even more great stuff (usually to the tune of 80-90 additional pages). His books are all DrivethruRPG PoD, though, so the printed book prices are expensive unless you pledge on its KS (for example, SWN goes for $60 for standard color, and $80 for premium). So... yeah, it's not out of the current range, but it's not on the cheap side either. It is perfectly fair to talk about price because that is a limiting factor which impacts the 'reach' of a product thus impacting the 'return on investment' for a player. That said, will there be people that buy it that the KS funds? Absolutely. If the goal is to just fund and get it out there, then they are on track to do that. Now the real question is, will there be less people that buy it because of the price and that is usually a yes as well. It is a limiting factor that impacts if a game becomes obscure or starts to grow. Now the one positive thing it has going for it is that it was specifically designed to use players, own models. There is no need to buy the rules and buy additional models, the ratio for of cost to start to play is less than other games, but the initial rules cost is more a bit more. Even in other games where the cost is the same, needing models, they usually have bigger communities. In order to compare Apples to Apples we need more information because honestly, the price is subjective. How many pages are there going to be in the book? How many of those pages are full and half page pictures and artwork? How many of those pages are actual rules? How many of those pages is just story fluff and background? Those questions will help put in perspective to other things they can compare price with. The PDF price though does seem higher than most but again subjective based on content. At least the hardcover book comes with a PDF, which is starting to seem like the new norm. The main reason everyone is talking about price is that there isn't much else to talk about currently. It is a shorter campaign, so I am expecting a playthrough video. That would help draw more people in over the price point hurdle vs if there is no playthrough video. 1. You seem to think softcover is a worse choice than hardcover rather than the superior choice. Why is that? 2. I appreciate that you are sticking to your guns without getting confrontational. However, I'm not quite sold on such an expensive book, even though it has the rules options I'm interested in, as well as fluff and art, the things I love most in a rule book. A PDF of $20 would have been an impulse buy for me. $30 isn't much more objectively, but psychologically it pauses me long enough to consider my impulses. 1) It's not that softcover is "worse" per say... but the durability of a quality hardback is typically greater, it sits much nicer on a shelf, and it just has a heft and substantial feel to it. I value a hardcover tome more than a softcover. I guess it's the same reason hardcover books for commercial consumption continue to be produced at all? I mean trying to deconstruct it, why does anyone buy a $30 hardcover of a Stephen King novel when the same words are also available in a smaller, more easily transportable, half-the-price softcover? Or even further why not go cheapest and get digital? I can't explain the reasoning behind it completely, but there is an enjoyment I have in holding and using a hardcover book that I don't experience with a softcover book or a digital book. 2) I understand that I am definitely a bit biased, as this game and its content (the style of the game itself, the theme, the artwork, the idealology, etc.) all appeal to me greatly, but also because I have been watching updates for this on Facebook for months now, so I've been eagerly anticipating this release. It's right at the top of my "Wants" list and has been for a while, so I've justified all of these costs and things to myself months ago. Haha! 1. People buy hardcover novels because they need to read the story now and the publisher won't release the paperback for a year. It's seen as a scummy tactic, and Black Library has lost a ton of good will and financial support for playing that game. And the last time I bought a hardcover Stephen King book was the last Dark Tower book because I wanted to read it before anyone could spoil it for me, and considering how low my opinion of the Dark Tower series is now you're making a losing case with that example. While I agree that a physical book is superior to a digital copy, I avoid hardcovers as much as possible. Having worked in a bookstore and seen how many hardcovers go on to become remainders, I suspect most book buyers feel the same way. They are uncomfortable to read anywhere but at a table, they are unwieldy to carry with you, and they cost way too damn much. If you just want hardcovers for your shelf, the friends of the library sell used hardcovers for $1 each. Take the dust jackets off and they all look classy, even the ones by James Patterson somehow. 2. I thought you were the project creator. My mistake. I haven't seen any Facebook stuff, so I've heard little of the sizzle before seeing the $50 steak. PS: Is shipping included in the $50, or additional?